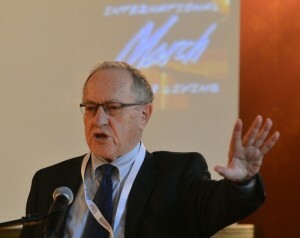 Human rights lawyer and pro-Israel advocate Alan Dershowitz speaks at “The Double Entendre of Nuremberg” symposium on May 4 at Jagiellonian University in Kraków, Poland. Photo: Yossi Zeliger. JNS.org – Why should the casual observer care about the seemingly obvious need to prosecute and convict Nazi war criminals, whether it be during the Nuremberg trials of the 1940s or similar proceedings in more recent years? Dershowitz and Irwin Cotler, renowned human rights attorneys and pro-Israel advocates, took center stage in Poland this week at an event that looked back on the Nuremberg trials and extracted lessons for the future. In Kraków on March 4 — the eve of Yom HaShoah (Holocaust Remembrance Day) — Jagiellonian University, March of the Living International, and the Raoul Wallenberg Centre for Human Rights hosted “The Double Entendre of Nuremberg: The Nuremberg of Hate, The Nuremberg of Justice.” The symposium was held to mark the 80th anniversary of Nazi Germany’s antisemitic Nuremberg Laws and the 70th anniversary of the Nuremberg trials — the Allied forces’ military trials of 13 prominent Nazi leaders. While the Nuremberg Laws were a precursor to the Holocaust, the trials served as a foundation for contemporary international humanitarian law. Now in its 28th year, March of the Living is an educational program that brings youths and adults from around the world on two-week trips to Poland and Israel “in order to study the history of the Holocaust and to examine the roots of prejudice, intolerance, and hate.” The “march” itself is a 1.86-mile walk from Auschwitz to Birkenau as a silent tribute to victims of the Holocaust. To date, the program has drawn 220,000 participants. Dr. Shmuel Rosenman, chairman of March of the Living International, said the theme of justice infused into this year’s program reflects the annual objective of adding an “extra touch” to the educational journey. How can the young generation connect with the particular theme of justice? “I think everyone — age 16, 17, 20, 30, 40 — knows that in our world, you don’t see much justice being done. So if you are taking the Nuremberg Laws, you are going to find that during the last 70 years, not much changed,” said Rosenman. Cotler told reporters in a pre-symposium briefing that there are two often-ignored lessons which are “central to this historic juncture” — first, that the Holocaust and other genocides occur as a result of “state-sanctioned incitement to hate,” and second, that genocide is enabled by “indifference and inaction” on the part of international bystanders. Dershowitz warned of what he described as the expiration of a “70-year-old statute of limitations against anti-Semitism.” While the wrongs of the Holocaust meant that Jews earned the right not be vilified, that right has seemingly evaporated on college campuses today, Dershowitz told reporters. The young generation doesn’t “remember the kind of bigotry that we had,” he said, paving the way for the emergence of the “new anti-Semitism”—the targeting of one nation and one group of people, Israel and the Jews. “[BDS] starts by focusing on Israel, and then asks, ‘What tactics can we use?’” said Dershowitz, emphasizing that BDS must be fought like any form of antisemitism. Asked if post-Holocaust declarations of “never again” can have any practical impact, Dershowitz responded that one “has to use every resource available to fight against bigotry,” including the tactics employed by the Nuremberg symposium in Kraków — moral suasion and statements by well-respected leaders. Cotler expressed hope that the symposium would help encourage parliamentarians from around the world to follow Canada’s lead in officially recognizing the link between anti-Zionism and antisemitism. Dershowitz, similarly, said it would be a significant step forward if more nations adopted the US State Department’s definition of antisemitism, which acknowledges that antisemitism can include the demonization of Israel, delegitimization of Israel, and application of double standards to Israel. As part of a panel of current and former justice ministers, Israeli Minister of Justice Ayelet Shaked echoed the symposium’s “double entendre” theme by emphasizing that while jurists and legal experts sanctioned the dehumanization of Jews through drafting the Nuremberg laws, legal experts also proceeded to design the corrective — the Nuremberg trials. “[The law] can lead to the abyss, but also make amendments,” Shaked said. “And European leaders should also heed the British lesson and affirm that antisemitism is unacceptable,” said Shaked. “Israel is proud to be part of the international community and is committed to the success of international institutions. But we will not compromise our sovereignty,” she added. Other prominent speakers at the symposium included former International Criminal Court prosecutor Luis Moreno Ocampo, former French justice minister Robert Badinter, Canadian Supreme Court Justice Rosalie Silberman Abella, former president of the Israeli Supreme Court Dorit Beinisch, British Master of the Rolls and Head of Civil Justice Lord John Dyson, Chief Justice of Rwanda Prof. Sam Rugege, Rwandan Supreme Court Justice Maria Thérèse Mukamulisa, and former Israeli ambassador to the United Nations Ron Prosor. The Nuremberg trials’ landmark achievement was that “leaders were accountable for massive atrocities” for the first time,” Ocampo said. At its conclusion, the symposium adopted a comprehensive “Never Again” declaration. “Never again will we be indifferent to incitement and hate,” part of the declaration stated. “Never again will we be silent in the face of evil; Never again will we indulge racism and antisemitism; Never again will we ignore the plight of the vulnerable; Never again will we be indifferent in the face of mass atrocity and impunity. We will speak up and act against racism, against hate, against antisemitism, against mass atrocity, against injustice, and against the crime of crimes whose name we should even shudder to mention: genocide.